Spectrally selective glass is high-performance glazing that admits as much daylight as possible while preventing the transmission of as much solar heat as possible. By controlling solar heat gains in the summer, preventing the loss of interior heat in the winter, and allowing occupants to reduce electric lighting use by making maximum use of daylight, spectrally selective glazing significantly reduces building energy consumption. The United States Department of Energy has established a light to solar gain (LSG) ratio of 1.25 as the minimum measurement to be classified as spectrally selective glazing. There are two versions of the LEED program currently in effect: LEED 2009 (v3) and the new LEED v4. All new projects must be designed using the LEED v4 rating system, but design professionals who registered projects with LEED v3, even projects not yet started, may continue to provide submittals for certification until June 6, 2021, when the rating system officially closes. The glass selected for the Mayo Civic Center expansion provides high visible light transmission, while its low solar heat gain coefficient controls unwanted heat to help buildings efficiently manage HVAC performance. 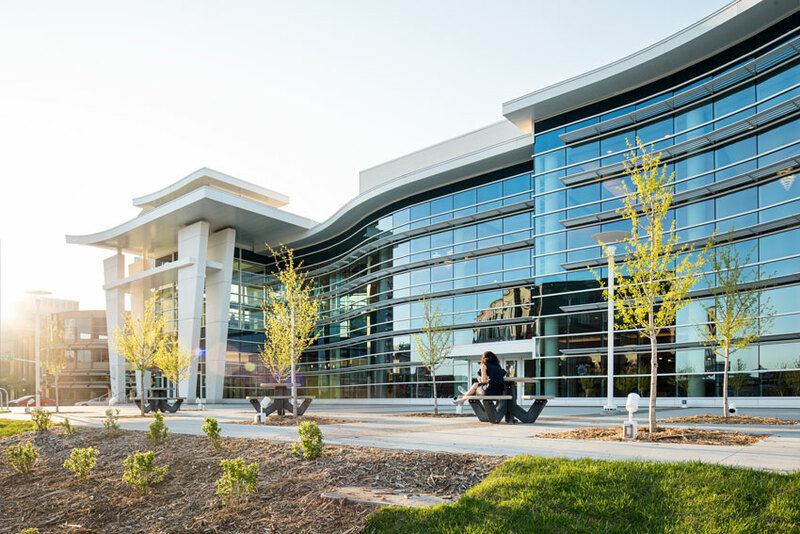 Some types of architectural glass can help contribute up to 20 total points in four of the six LEED categories in both LEED v3 and LEED v4 green building programs. For example, in the Sustainable Sites category, architectural glass tested by the American Bird Conservancy can satisfy the requirements for the Bird Collison Deterrence credit. Glass with an SR value of 0.33 or above reflects solar energy and can be used to reduce the heat island effect, contributing toward the Heat Island Reduction credit. Glass products with an environmental product declaration (EPD) and a health product declaration (HPD) are now available, providing transparency and contributing toward several credits in the Materials and Resources (MR) category, including the Building Product Disclosure and Optimization credits. “Architectural glass products can help architects realize their most inspired visions while also delivering the sustainability performance that’s essential in today’s new construction and retrofit projects,” explains Darijo Babic, architectural sales director, Guardian Glass. In summary, there are now glass, HVAC, insulation, and lighting solutions that help designers to satisfy multiple sustainable design criteria simultaneously. Glass can provide views and protect the interior from glare and solar heat gain. HVAC systems can update existing structures to provide modern-day performance, without impacting their historic appearance. Insulation products can wrap a building in a continuous thermal blanket and offer fire resilience and resistance to mold and mildew. Highly efficient LED luminaires can still create a comfortable, inviting interior and be manufactured in a very eco-conscious way. The options available for sustainable design have evolved beyond forcing designers to compromise—now they can have it all.